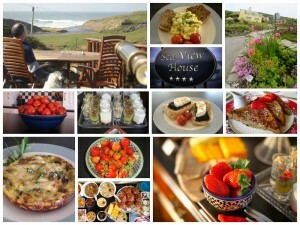 At Sea View House we love food. We love to grow it cook it and eat it. Nearly all that we eat ourselves or serve to our guests is either homegrown produced or sourced locally. Food Miles: By sourcing as much of our food as possible from local producers and our gardens, we reduce the food miles (the distance that food must travel to get from farm to fork) of the food we serve. Our menu indicates the food miles of every dish we serve. Eggs: Eggs come straight from our Ducks and Chickens. Fruit and Vegetables: Our home is based on the family farm allowing us to produce some of the fruit and vegetables we use in the kitchen. Rhubarb, strawberry’s, potatoes, apples come from our garden and small orchard. Breads, Fruits, Jams and Preserves: Rather than buy in packaged and tined food we try to bake and cook as much as possible in our kitchen. We make our own jams and chutneys. Yoghurt: We make all our own yoghurt here at Sea view House. Goats Cheese from St Tola Organic Goats Cheese in Inagh. 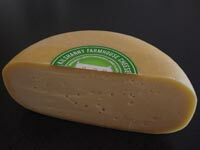 Cheddar from Cahill’s Farmhouse Cheese in Limerick. Smoked Salmon: Our smoked Salmon comes from the Burren Smokehouse in Lisdoonvarna. Fish: Garrihy’s Seafood just up the road from us supply us with our breakfast Kippers. Black Pudding: We get our delicious handmade Bonina Black pudding from C&M foods in Tulla Co Clare. Pork: All our sausages and smoked bacon are supplied by Loughanes of Galway. Groceries: General groceries are bought at Jordan’s in Lisdoonvarna or Supervalu in Ennistymon.